Awww sad face, this is the last Farm Fresh Friday for the month of December. 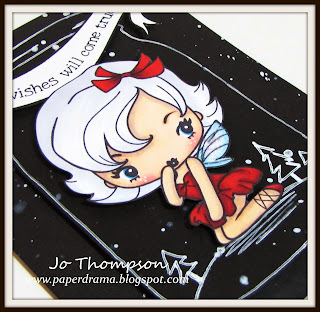 The theme of this challenge is "Christmas Wish", to grant this wish is the Digi Cheeky Fairy. She is colored with my Copics and for her sparkly wings I used Stickles Star Dust. She is encased in a mason jar, that I cut from a Sizzix die and traced an outline with my white gel pen. For the snow background, I used my favorite technique using Lindy's Stamp Gang sprays. I used two different white colors and tapped the sprayers over the cardstock. The cute banner has the perfect sentiment "your wishes will come true". This card was so fun to make. She's a captured fairy, unlimited wishes! Come join in this fun challenge over at the TGF Blog. FFF - B&W w/A Splash of Color! Hi my lovelies!I made a Valentine's Day card for you today. A bit early but whatevs =)The TGF Farm Fresh Friday challenge is up and it's "Black & White, with a Splash of Color!". Here I use the Dreamy Kit and OA - Valentine from The Greeting Farm. My "Splash of Color" is red. I love the color combo Black, White and Red. 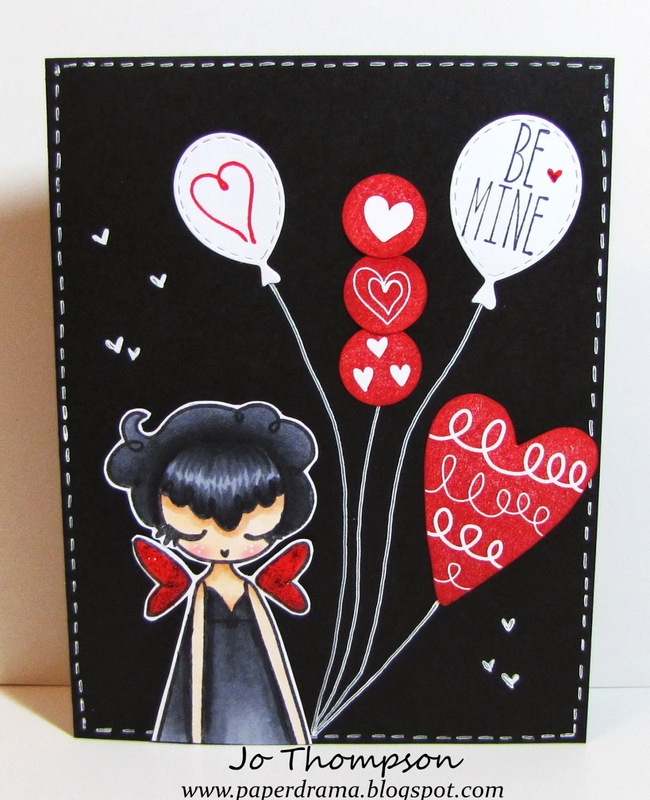 I did a bit of doodling with the tiny hearts, the balloon strings and the faux stitching around the border. The heart balloons are from the Dreamy Kit, they were stamped in red ink and then I fussy cut them. I stacked the small heart circles to create a long balloon. I also added some balloon die cuts into the mix. The "Be Mine" sentiment is from the OA - Valentine set. Lastly, I added some Xmas Red Stickles to her heart wings and the tiny heart that is next to the sentiment. This card was so easy but a lot of fun to create. Check out the amazing projects that the other DT members created over at the TGF Blog. Come and play along and enter to win! 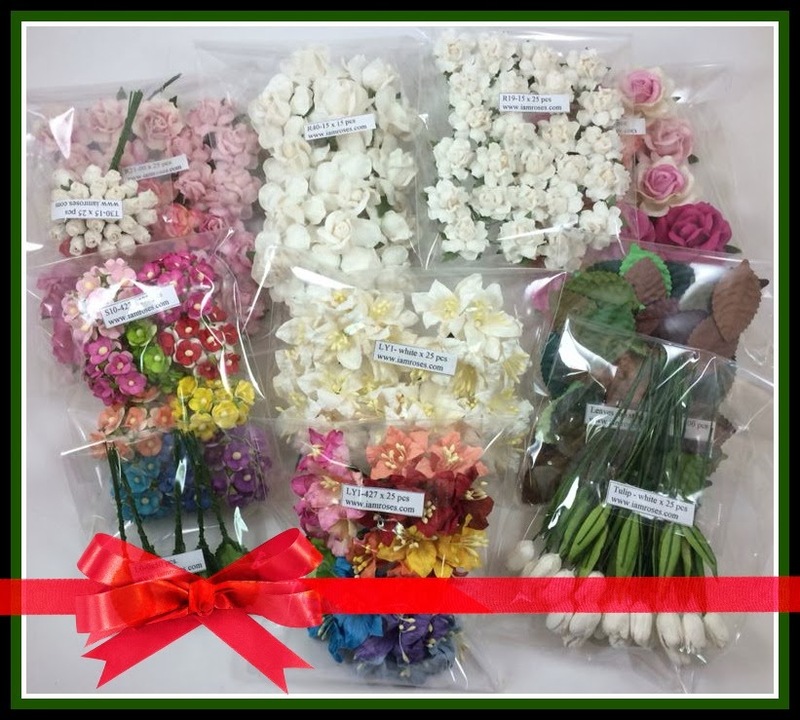 Were you one of the two lucky winners of this prize? Happy Friday! It's The Greeting Farm's Farm Fresh Friday challenge: All that Sparkles. Here is a holiday birthday tag that I created using Birthday Anya 3. She is glittered head to toe in Stickles glitter glue. I colored her with my Copics and popped her up with dimensional foam dots. For the background I cut out a snowflake using the TGF Snowflake Die, then I used it as a stencil mask and pounced white pigment ink all over it. I drew some faux stitching around the tag with a white gel pen. I flattened a mini cupcake wrapper and layered a button and a glittered heart die cut for an embellishment. I also outlined in Stickles the banner die cut in the background. Come join us over at the TGF Blog for this fun challenge. Have a beautiful day and weekend! TGF Cyber-Monday Celebration Blog Hop: Mmmm Hot Cocoa! Happy Cyber-Monday! 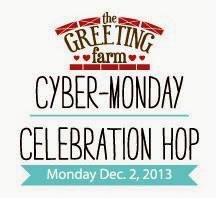 Welcome to the TGF Cyber-Monday Celebration Hop. This is a biggie and I hope that you are enjoying it so far! Let's get to my project for you today. Okay I love digital stamps, here is another digi Beanie Ian (now available exclusively in rubber) from The Greeting Farm. Hot chocolate on a cold day is so yummy, especially with marshmallows. I colored Ian with my Copics and paired him up with the TGF Snowflake Die. Can you tell I'm obsessed with this die? This is like the third time I've used it in my cards. I cut several out in red & white cs when I first received it in the mail LOL. The paper I used was perfect with this image, hot cocoa with heart marshmallows..cuteness! The hot chocolate sentiment is from an old stamp set from the dollar bins at Michael's. That is my card for you to start off the week. I'm last on the hop list, but if you haven't seen all the amazing hoppers, head on over to The Greeting Farm Blog to see the complete list. Hi everyone, WELCOME to the I Am Roses "Tis the Season" Blog Hop. If you are following the hop, you are coming from R.Maria Sabina. There is going to be so much holiday inspiration on this hop, hope you enjoy! So here is what I have created for you today, I made a decorative bow from scratch, no sewing at all. This creation of mine will grace the front of my apt. door. The bow measures approx. 16.5" x 23". I used some grey chevron burlap trim for the bow and two mini wooden wreaths for the center. 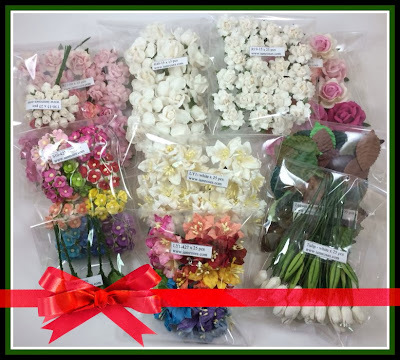 Here are close up photos of the mini wreath. Everything I used to construct this bow all came from my craft stash, yay for not needing to go to the store! The larger of the trio of roses is a R60 (2") and the other two in red are R77's (2"). White Foam Head Stamens (ST1), Small Red/White Scrapbook Flowers (S10), and Red/Green Lilies (LY1) are used as beautiful fillers to make the wreath look more lush. I used Maple Leaves (L0) as the base for the flowers to lay on. I also filmed a start-to-finish video that you can watch here: Paperdrama. Let's get on to the details of this hop. Next up on this hop is Tamara. THANK YOU so much for taking the time to hop along!